Dr. Nairn is proud to be the only physician in New Mexico offering the DRX-9000 decompression system for low-back pain. 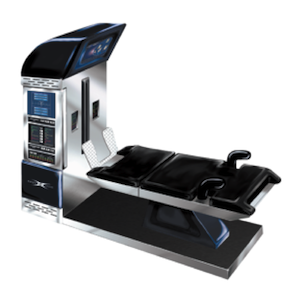 The DRX-9000 is a non-surgical spinal decompression machine used to treat lower back pain and/or sciatica. The technology was originally invented by a neurosurgeon, Dr. Norm Shealy. The DRX-9000 uses a special kind of traction aimed at taking the pressure off the lower spine. Through the application of negative pressure. The DRX-9000 is designed to relieve chronic pain by enlarging disc space, reducing disc herniation, and reversing high pressures. Spinal decompression through the DRX-9000 involves the application of forces to elongate the spine without causing contraction of the muscles that guard the spine. This pressure drop facilitates movement of fluid, carrying nutrients and oxygen inside the disc and help draw in the herniated or bulging disc. What happens during a DRX-9000 treatment? The usual protocol is 20 sessions spread over 4-6 weeks. The treatment sessions last approximately 30-45 minutes. During each session the patient relaxes on a comfortable, padded bed and may listen to soothing music. They are secured into position by upper and lower body harnesses. There are usually 18 phases where spinal decompressive forces alternate on and off. These cycles are thought to create a pumping action that simulates the natural processes responsible for nourishing the intervertebral disc. Each session ends with application of electrical stimulation and ice to the lower back to help the muscles relax after treatment. Who does the DRX-9000 help? Clinical studies have shown that the DRX-900 can achieve outstanding results in relieving debilitating lower back pain and/or sciatica. Pre- and post-treatment MRI scans have shown greater than 50% reduction in the size of disc herniations after 4 weeks with the DRX-9000. In fact, during an initial clinical study with the DRX-9000 more than 82% of patients reported relief of back pain after the full spinal decompression treatment. Some patients may experience minor side effects from the DRX-9000, such as muscle spasm/soreness. Most patients find the DRX-9000 therapy comfortable and soothing. Very rarely the DRX-9000 therapy will make the patient’s pain worse, but usually this is only temporary.